kadai paneer gravy - slightly spicy and tangy recipe of cottage cheese cooked with tomatoes and freshly ground coriander and dry red chilies in a kadai. 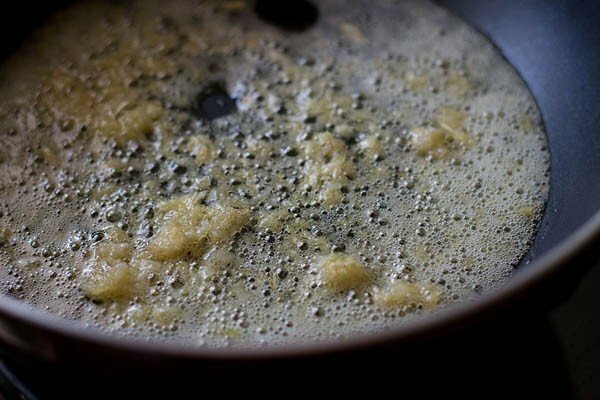 kadhai paneer gravy recipe with step by step photos. slightly spicy, tangy and delicious kadai paneer recipe. it is one of the most easy to prepare yet delicious paneer recipe. 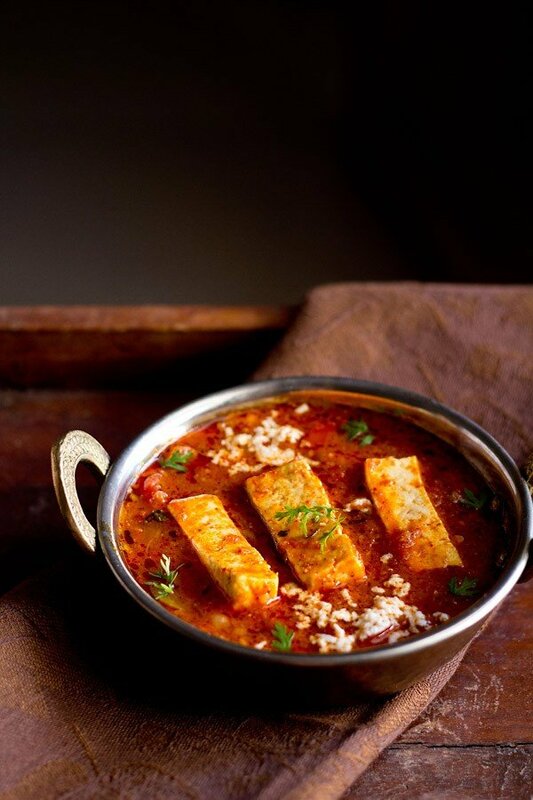 the recipe gets its name ‘kadai paneer’ as it is made in a kadai (kadhai or karahi). kadai is a utensil which is similar to the chinese wok – the only difference being, kadai has more depth than the wok. in fact in india, the kadai is used as an utensil for deep frying as well as to make many dishes like kadai mushroom or veg kadai. 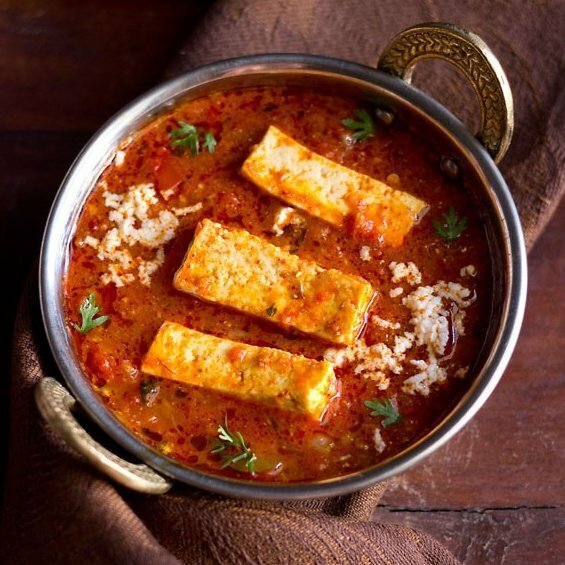 this delicious kadhai paneer recipe is a gravy version. its easy to prepare. you can make it at times when you get unexpected guests, or you are too tired or in no mood to go for an elaborate cooking process. there is one more recipe of semi dry kadai paneer with video also posted the blog – restaurant style kadai paneer. 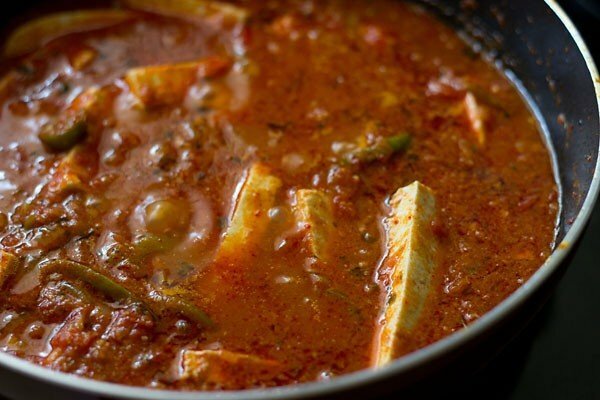 to make karahi paneer gravy, you will need paneer in handy and the usual indian herbs and spices. the recipe uses a lot of tomatoes. for the base i have added onions, tomatoes and freshly roasted and powdered coriander seeds and kashmiri red chilies. both these spices impart a lot of flavor in the dish. the kadai paneer gravy or curry is tangy and this comes from the tomatoes. if you prefer to balance the tang, then add some cream towards the end. use fresh red and ripe tomatoes in this recipe. avoid using tomatoes which are sour. the recipe is slightly spicy. 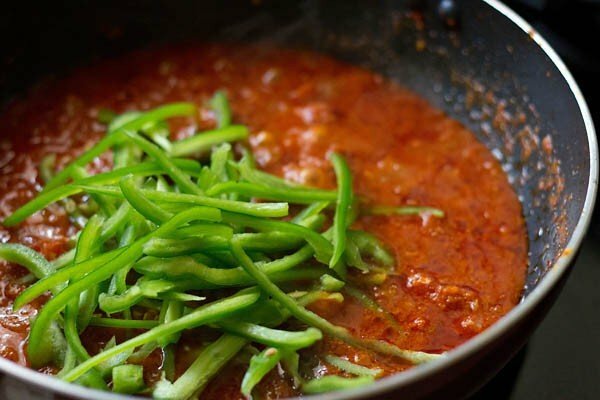 reduce the quantity of red chilies if you don’t want any spiciness. 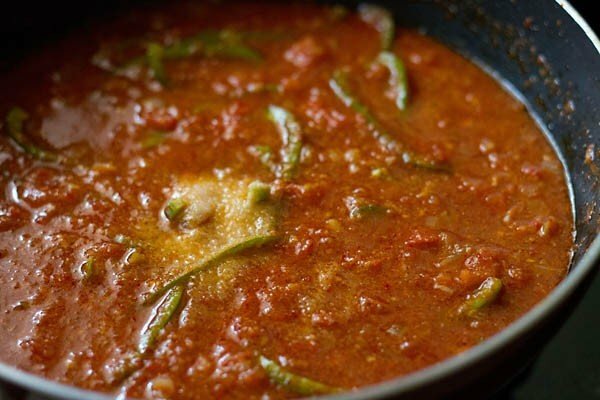 the dry kashmiri red chillies added here, give a nice red color to the gravy accompanied with the tomatoes. kashmiri chilies have less heat as compared to other varieties of red chilies. if you don’t have kashmiri chilies, then use any indian dry red chillies. just reduce the quantity depending on the heat and pungency of the chilies. 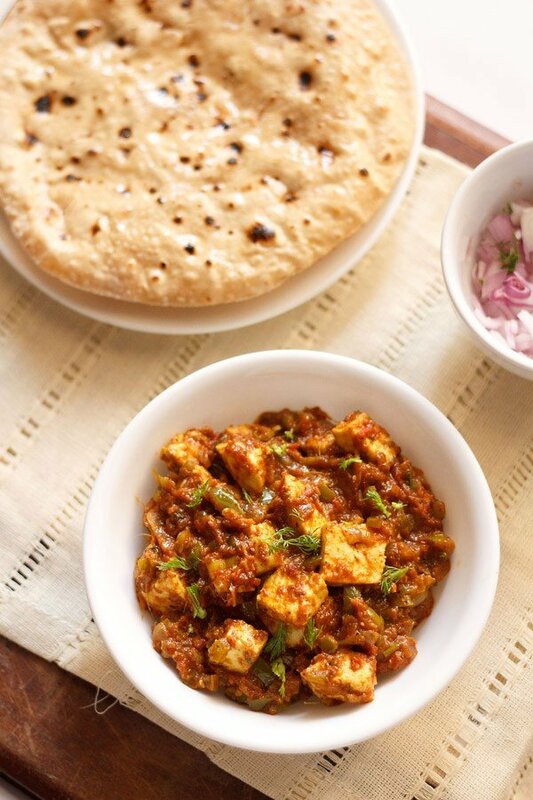 since this kadhai paneer is a gravy recipe, it goes well with the usual rotis, parathas or rumali roti or naan and also equally well with plain steamed rice or jeera rice. 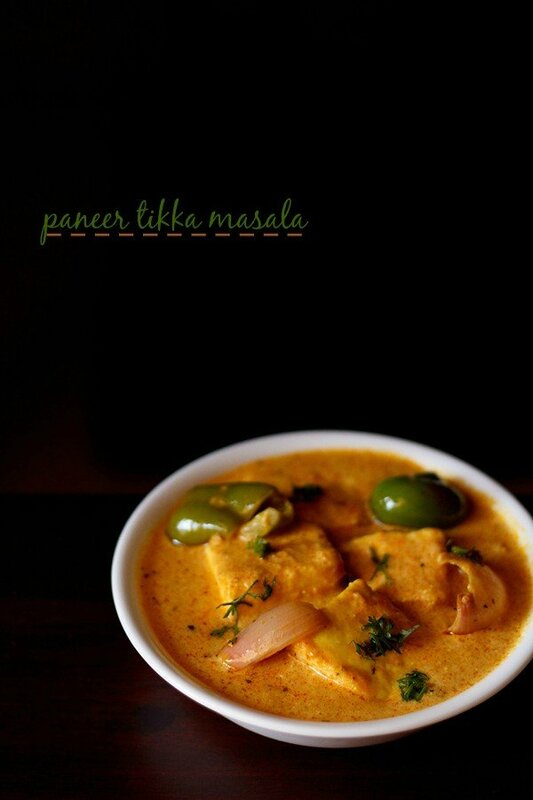 the kadhai paneer is again adapted from jigg kalra’s recipe. 4 to 5 dry kashmiri red chilies, if using any other variety of dry red chilies, then reduce to 2 to 4 depending on the heat and pungency of the chilies. first roast the coriander and dry kashmiri red chilies in a pan on a low flame till aromatic. when the spices cool, grind both of them in a grinder to a semi fine powder. keep aside. finely chop the onions. julienne (cut into very thin strips) the capscium/green bell pepper. finely chop 2 tomatoes. roughly chop 5 tomatoes and add them to the blender. make a puree of the tomatoes. keep the tomato puree aside. in a pan heat butter or oil or ghee. then add the ginger-garlic paste and saute till their raw aroma disappears. then add the chopped onions and saute till transparent. add the ground coriander and kashmiri red chilli powder that we made. also add green chilies. mix well. then add the finely chopped tomatoes and sauté till the tomatoes become pulpy and you see oil releasing from the sides of the tomato masala. stir well and continue to saute till you see oil leaving the sides. about 9 to 10 mins on a low flame. add the capsicum/green bell pepper julienne. stir and simmer for 2 to 3 minutes on a low to medium flame. add water and salt and continue to simmer for some 7 to 8 minutes. later add crushed kasuri methi/dry fenugreek leaves and garam masala powder and stir. add paneer cubes or slices. stir gently. 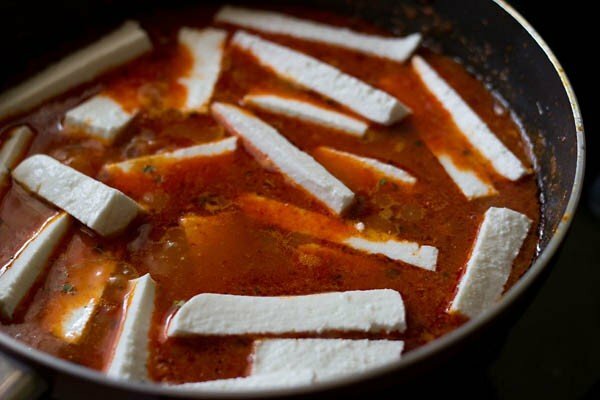 cook the paneer for about 1 to 2 minutes. you can also 2 tbsp of cream toward the end. 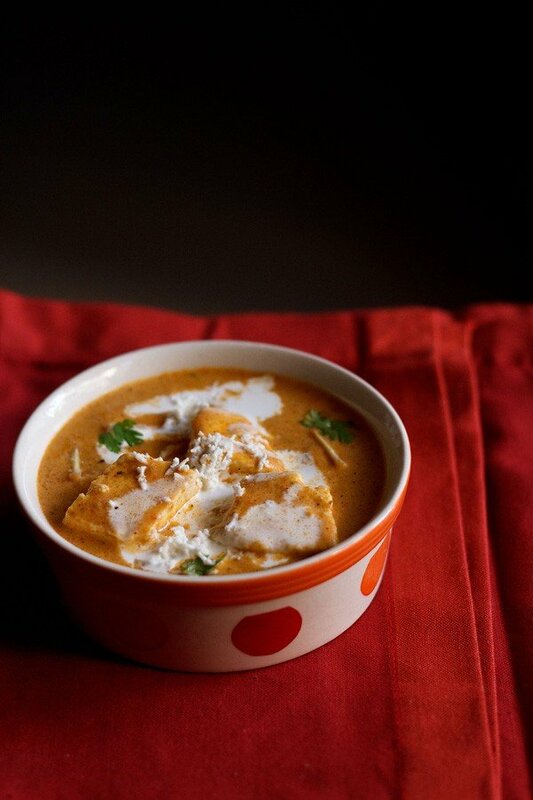 just stir the cream gently in the kadhai paneer gravy. 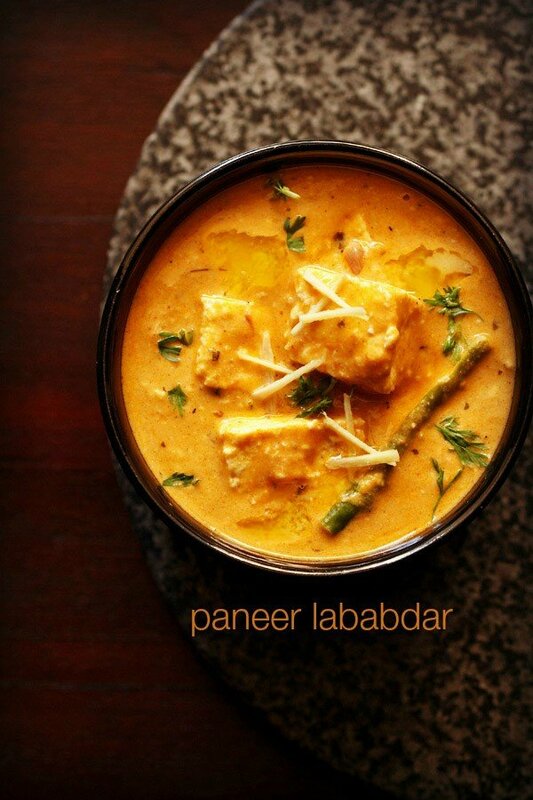 garnish with chopped coriander leaves and serve kadhai paneer gravy with rotis, naan, steamed rice or jeera rice. 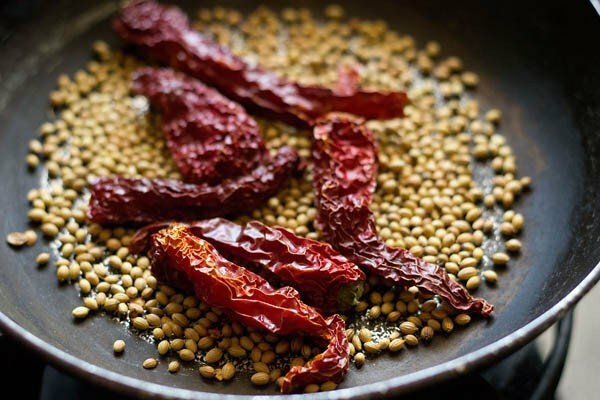 1. first roast 5 teaspoon coriander seeds and 4 to 5 dry kashmiri red chilies in a pan on a low flame till aromatic. 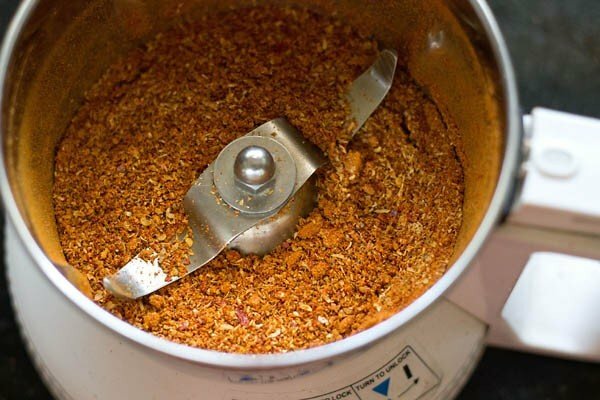 2. when the spices cool, grind both of them in a grinder to a semi-fine or fine powder. 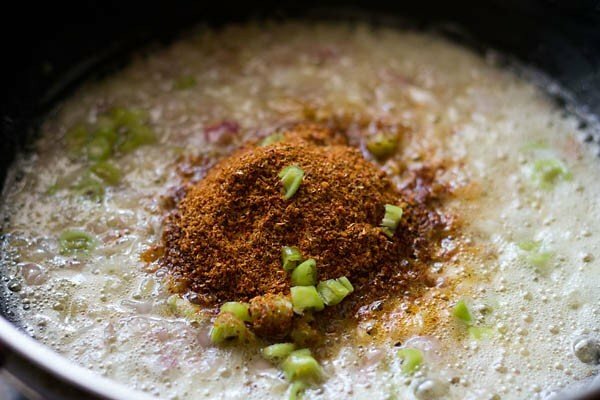 avoid keeping the powder coarse as then the gravy has grits and the masala comes in the mouth while eating. 3. in a pan heat 2 to 3 tablespoon butter or oil or ghee. then add the ginger garlic paste (1.5 inch ginger, chopped + 7 to 8 medium sized chopped garlic, crushed in a mortar-pestle to a fine paste). saute till their raw aroma disappears. 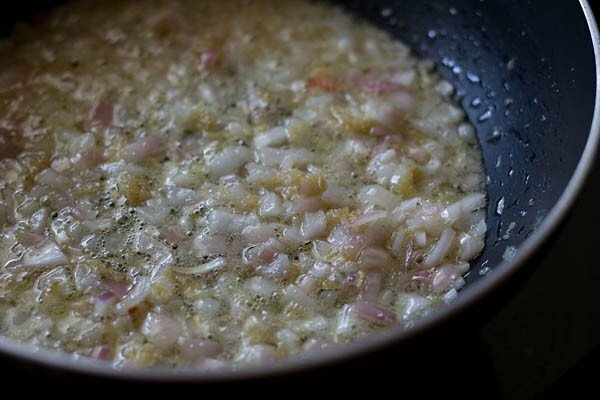 4. then add 2 medium sized chopped onions (100 grams) and saute till transparent. 5. add the freshly ground coriander and kashmiri red chili powder. also add 1 to 2 chopped green chillies. 6. mix and stir well. 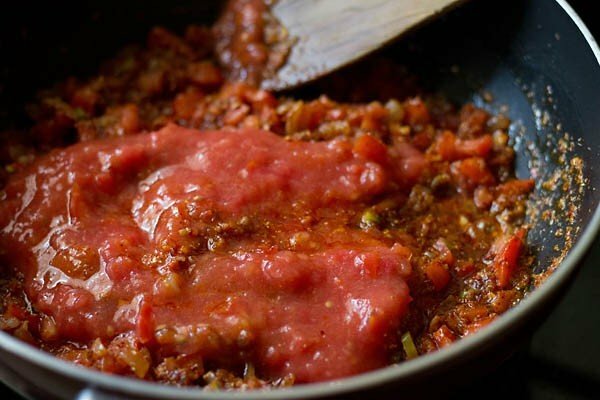 7. add 2 medium finely chopped tomatoes. saute till the tomatoes soften and become pulpy. you will also see oil releasing from the sides of the onion-tomato masala. then only add the tomato puree (5 medium tomatoes, pureed in a blender). 8. stir well and continue to saute till you see oil leaving the sides. about 9 to 10 mins on a low to medium-low flame. 9. add 1 small to medium sized capsicum (green bell pepper) julienne. stir and simmer for 2 to 3 minutes on a low to medium flame. 10. add ½ to ¾ cup water and salt (as required). continue to simmer for some 7 to 8 minutes. once the gravy is done, you will some oil specks on the top. 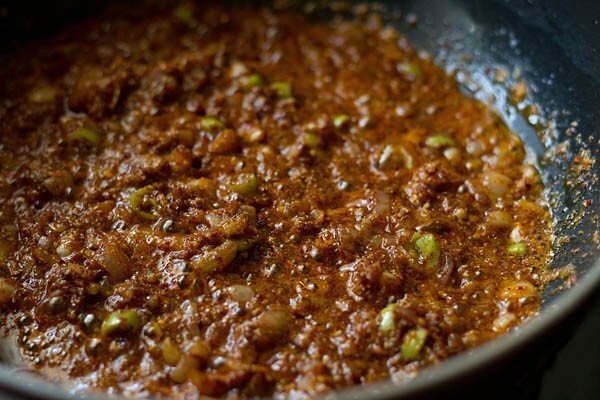 11. then add ½ tablespoon crushed kasuri methi (dry fenugreek leaves) and ¾ to 1 teaspoon garam masala powder. 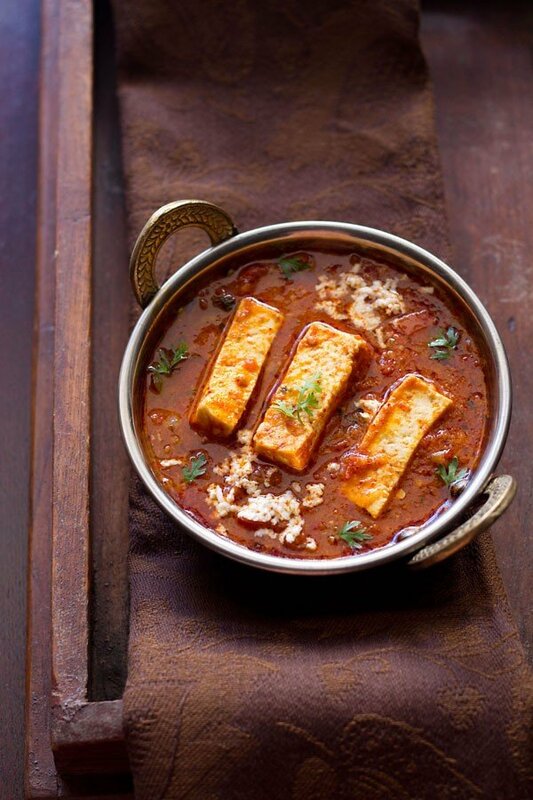 stir the kadai paneer gravy. 12. then add 250 to 300 grams paneer cubes or slices. stir gently. 13. simmer till the paneer is cooked, for about 1 to 2 minutes. don’t overcook the paneer as then it will become hard and you won’t get the desired texture in the paneer. 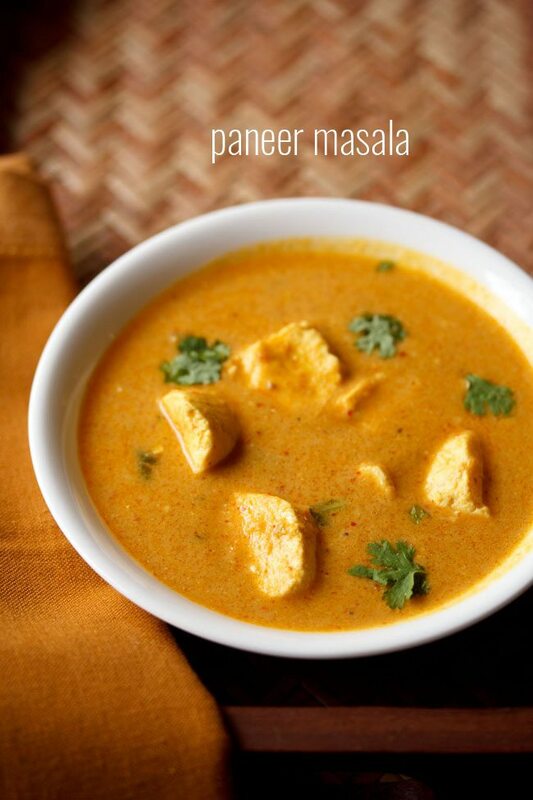 once the paneer is cooked, then you can also add 2 tablespoons cream. just gently mix the cream in the gravy. 14. garnish with chopped coriander leaves or grated paneer. 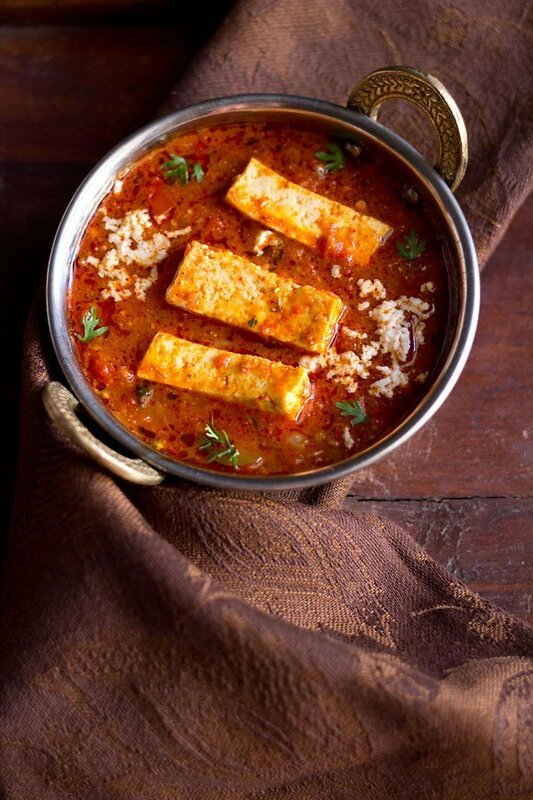 serve kadhai paneer gravy with rotis, naan, steamed rice or jeera rice or biryani rice. Not one has failed me!! They all have turned out amazingly well!!!! Thank you so much for sharing these recepies!! welcome merlyn. thank you for sharing the feedback on these recipes. i am glad that turned out amazingly well. happy cooking. 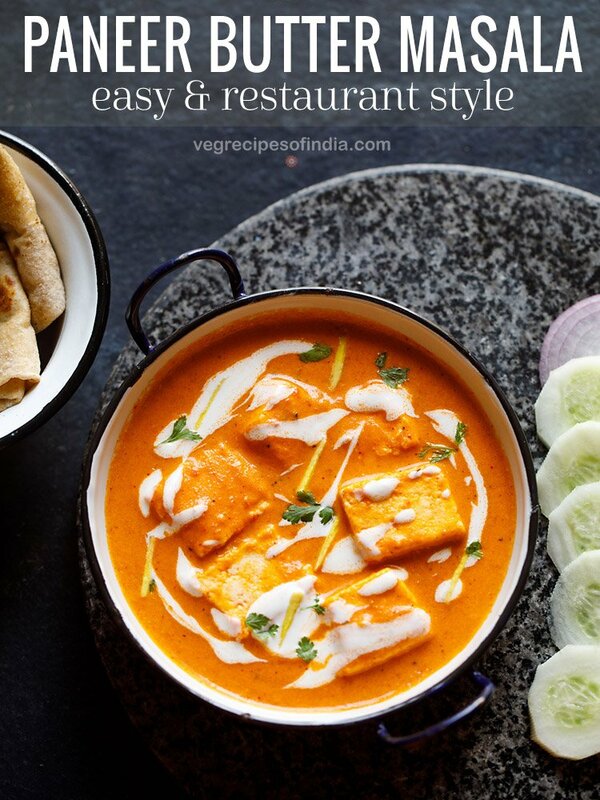 Whenever i need to check out for any new recipe i just blindly come to your website becoz i’m sure you will have the best and easy ones… This Paneer recipe is just awesome and loved it.. Keep up the good work!!!! thank you much vijaya. so glad to read your comment. also thanks for the feedback and review on kadai paneer gravy recipe. happy cooking. thank you nysha. happy cooking. Thanks for the recipe. Made it and tasted wonderful. Fee queries though. I thought it was slightly sour inspite ofvusong rioe tomatoes. Should reduce the tomatoes next time? Also I felt the ones we get in restaurant Asteria thicker/ richer. What did I miss out? welcome jyoti. the restaurant kadai gravy recipes have cream and cashew paste added to the gravy, thats why the thickness and richness. but usually kadai paneer gravy has a slight tangy taste. you can definitely reduce the tomatoes next time. I have added a pinch of sugar to avoid the tangy taste of tomatoes, taste good. Welcome Jaspreet. Nice to know this. Thanks for your positive feedback. 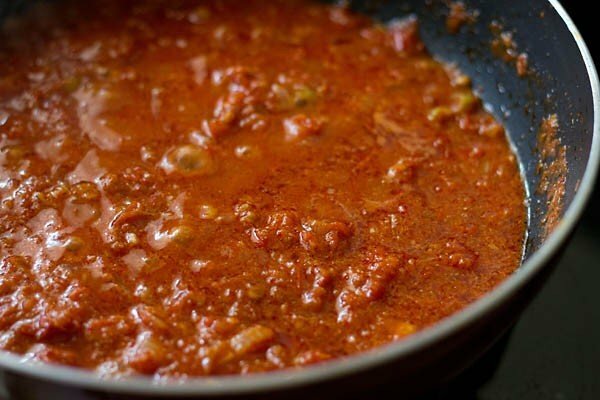 Can I substitute fresh tomatoes for tin tomatoes and if so what measurements? kelly i have never used tinned tomatoes. so i have no idea regarding their taste, whether they are less sour or mores sour. so i am unable to tell you how much tomatoes you can add. since tomatoes are one of the main ingredient in this recipe, i would suggest to add fresh tomatoes. Kelly, go ahead and use canned tomatoes. I put in 1/2 tin of a 450 gms of diced tomatoes. My paneer was 200gms. The colour and the taste were great. I left out the tomato purée because as compared to fresh tomatoes,canned ones are more intense in colour and flavor . Thanks Dassana for another great recipe. thanks anu for replying to kelly. 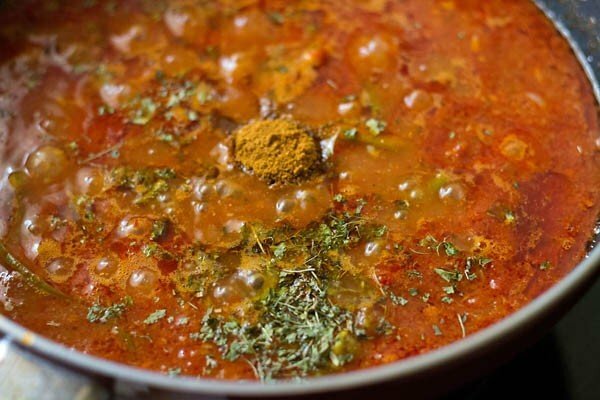 even my doubt is solved regarding canned tomatoes and your suggestion will help readers who want to try kadai paneer gravy with canned tomatoes. thanks again. I added 2 TS of sugar as I didn’t have cream and it turn out great. Thanks for the recipe. welcome rahul and thanks for the feedback on the recipe. I have tried so many recipes of urs. All turned out delicious. But I m so much frustrated with red gravy with tomatoes. Whenever I make punjabi sabji with only tomatoes it becomes sour. I tried with riped tomatoes even I added cream everything I tried but it becomes sour. What do I do with this? I have to add onion all time in gravy. Please guide. And biggest thanx for serving us delicious recipes. roshni, try using large sized tomatoes and ones which are red in color. the smaller sized round tomatoes can be too sour. you can also add some cashew paste or almond paste to balance the sourness. some khoya (mawa) also helps in reducing the tanginess. apart from that a bit of sugar can also be added. and yes as you mention onions and cream both help. Thanks Diksha for sharing positive feedback. My only critique is that I would add ALL the spices (included fenugreek) after the tomatoes turn pulpy, but before the tomato puree. This will make the spices more flavorful and fragrant! thanks for the suggestion patrick. generally most of the spices are added in indian cooking are added in oil, so that they release their essential oils and aroma which infuses the dish with their flavors. but in this recipe, you can add the ground red chilies and coriander to the tomatoes. you can even add once the tomato puree is sautéed. for more flavors from the fenugreek, they can be sautéed directly in oil. for a light flavor, its advisable to add them once the gravy is done.